Time to share my latest tour! I’m so glad to be back to tell you all about my latest one. I had such a nice time and I’ve been dying to finally write about it. 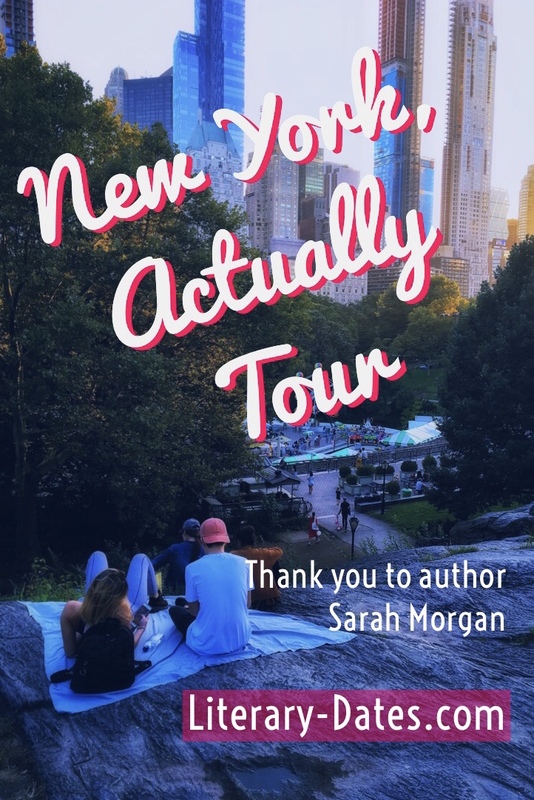 I read Sarah Morgan’s book New York, Actually which inspired a tour of Central Park and the Met (among a few other spots). If you didn’t read my book review and sneak peek into my tour, you can find it here. Let’s set the stage. You know that the male lead, Daniel borrows a dog from his sisters who own a dog walking business. They also help rescue and adopt out some very deserving dogs. Daniel borrows a German Shepherd from them that he names Brutus. He’s hoping that Brutus will help capture the attention of Molly who runs in the Park with her Dalmatian, Valentine. Recently, I learned from a coworker that a local rescue allows people to come in and walk their dogs. I knew I had to do it! You know I love dogs and how perfect is it that I happened to learn about this opportunity before going on this tour? Time to borrow a dog! I head over to Sean Casey Animal Rescue. 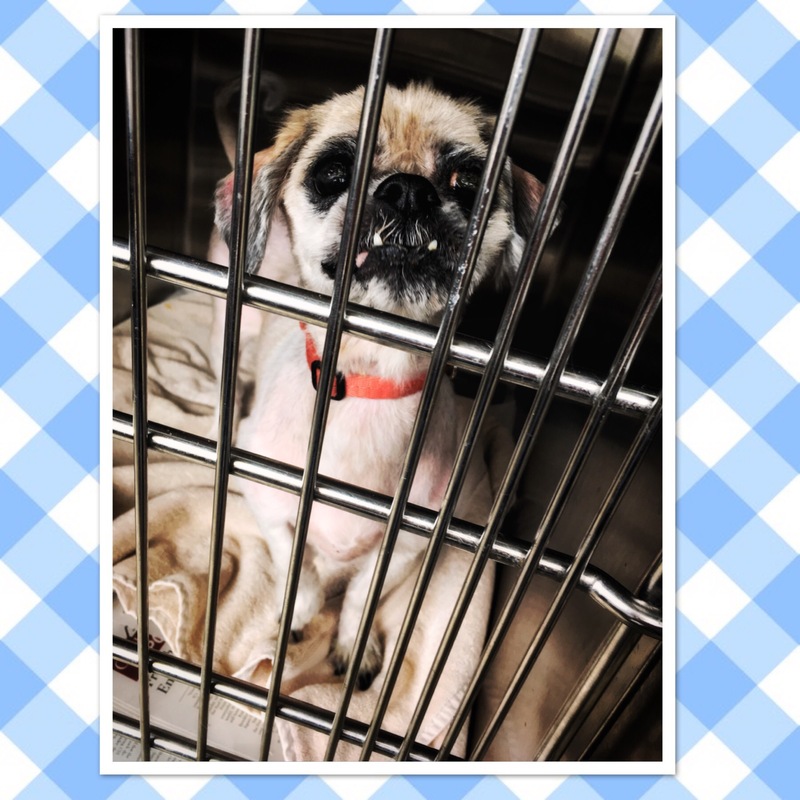 From their website: “Our rescue takes in over 2000 animals per year…we have saved over 8000 animals…since 1998.” This awesome nonprofit takes in “rescued, neglected, confiscated, injured, ill, and unmanageable animals.” They care for and treat these animals before adopting them out into loving, forever homes. It’s a great place. I’m glad I got to visit and plan to go back to walk more dogs (and maybe adopt one day). When I arrived, I asked which dog was in most need of a walk, so they gave me a little Shih Tzu to take out. No name for the little guy, but I was handed his leash and some poop bags and I was on my way. I focused completely on the safety of the pooch during the walk so no pictures from our walk, but I definitely got one when we returned him to his cage. I wish I knew his story. It was a bit busy there so I didn’t ask. I’m a bit shy so I didn’t talk much to anyone who worked there. I’ll work on that! I think this sweet dog was probably on the older side. 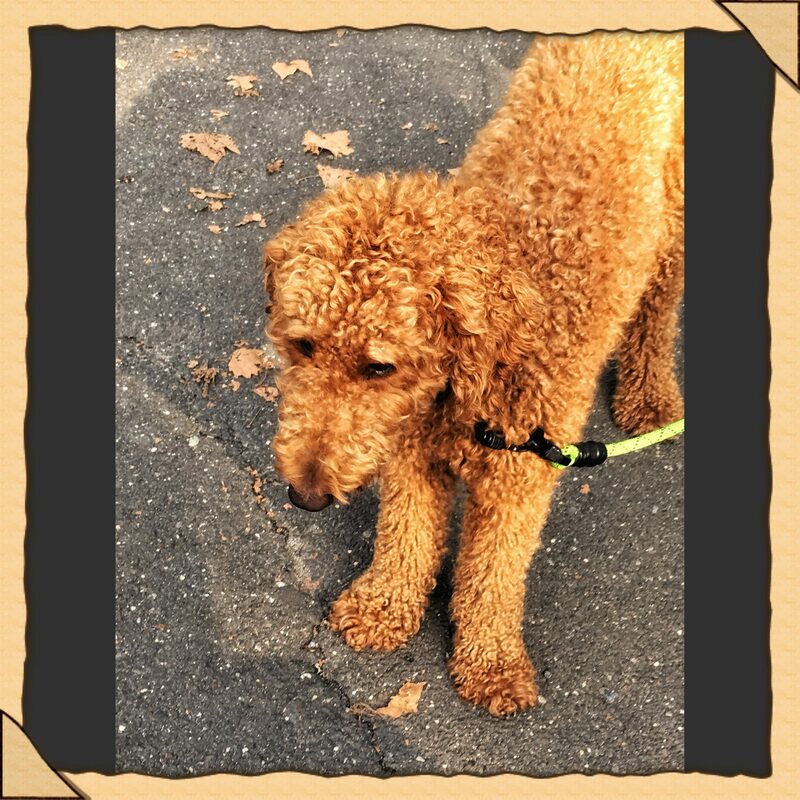 He was quiet, slow and a bit hesitant as we walked. At one point, we came to a door of an apartment building, he stopped, and didn’t want to move. He even cried a little. It was kind of heartbreaking. I hope he finds a good home. They are treating his eyes, so hopefully soon he’ll be better and adopted out. I tried to give him some love, so I hope he felt it. Thank you Sean Casey Animal Rescue for your great service to all kinds of animals in need of love and care. I will be back! After leaving there, I head to the train to take me into the city. Whoa. Weekend train travel can be a major letdown in case you didn’t know. I had the longest wait ever for the train, but you don’t want to hear me complain, right? I live in freakin’ NYC after all and I just visited shelter dogs. What’s wrong with me? Well, we New Yorkers sometimes can be the ultimate complainers, but I’ll stop…for now. My spirit was dying while I waited. Okay, now I’m done. Once I finally made it into the city, ya know food was on my mind and thankfully the book gave me an exact place to go. 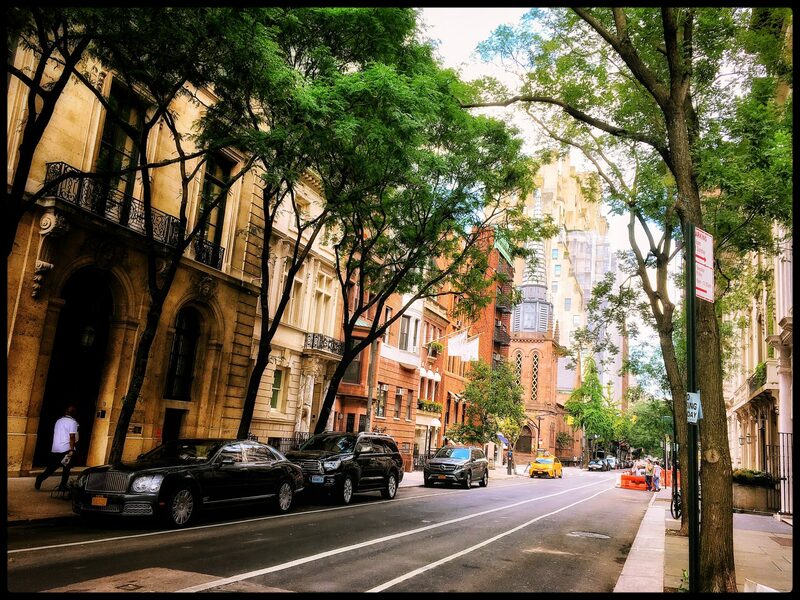 I headed to one of Molly’s favorite spots in her neighborhood on the Upper East Side. 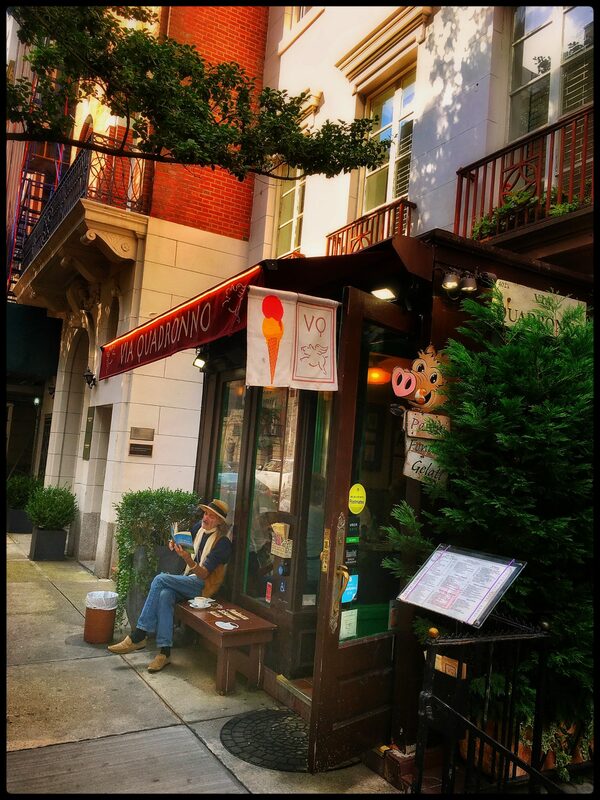 Via Quadronno, 25 E 73rd St.
My favorite thing about this restaurant was the guy sitting outside it. I wonder what his story is? I should have joined him because it just goes downhill from here. In Via Quadronno’s defense, it’s probably not meant for vegetarians. I struggled to find something that appealed to me. However, I was hopeful because I chose a panini that had two kinds of cheese- brie and mozzarella! I love cheese. Surely it’ll be loaded with cheesy goodness, right? I see a whole lot of arugula and had to hunt for the cheese. The greens didn’t even have any kind of tasty dressing. Bleh! Not gonna sugar coat- major disappointment. Maybe meat eaters can find something good, but if you’re vegetarian, they are not looking to properly feed you. Maybe they want to keep us out? I left still hungry so the only thing to do to boost my mood was to go to another one of Molly’s favorite spots. Surely I will have better luck. Come on Molly, do not disappoint me! On the way to the next spot, I snapped some pictures of Molly’s neighborhood so you can get a better idea of where the story takes place. 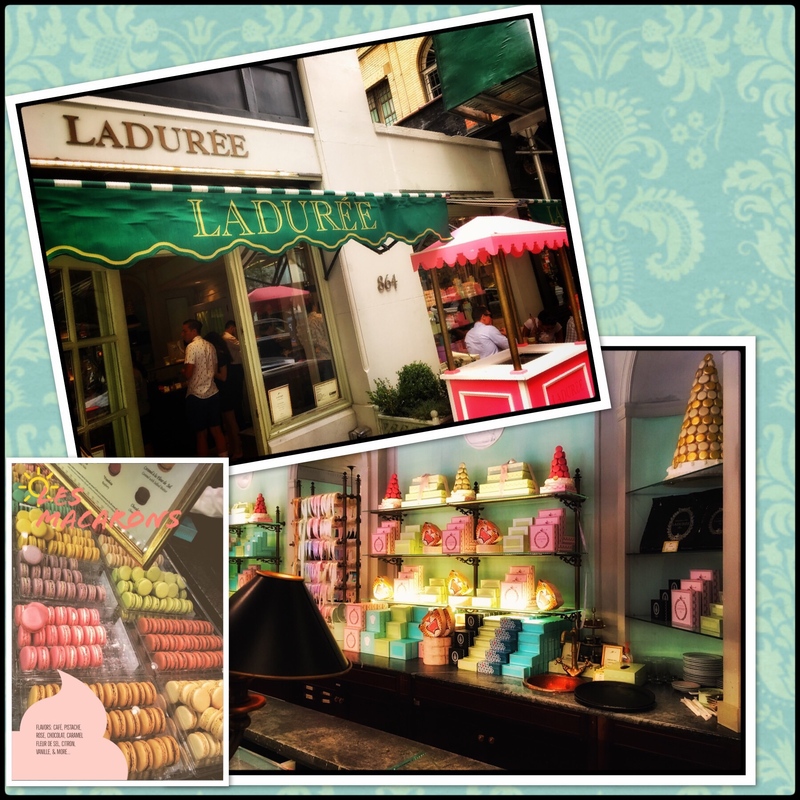 Molly indulged in macarons at Ladurée whenever she felt the need to celebrate and so I celebrated the fact that I was on my latest tour and bought a dozen macarons! Yum! 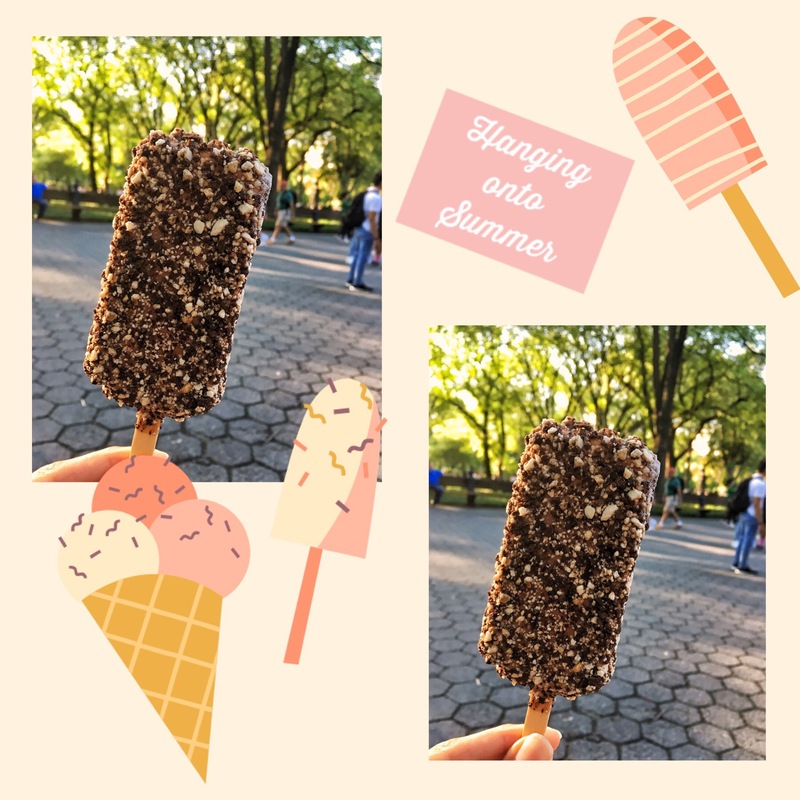 I left with my pretty mint green bag and headed to Central Park to indulge in the yumminess. Daniel and Molly meet in the Park, so of course, that would be a big part of my tour. I was looking forward to getting back to Central Park. Going back felt nostalgic because it played a central part in my very first book tour back in chilly February. I did my Breakfast at Tiffany’s tour back then. At that time it was a little rainy but it was still cool to see some people out exploring. It had a quiet beauty back then. This time, it’s the end of summer, a warm day, and EVERYONE was at the Park. Yes, EVERYONE! Pretty lovely right? As usual, bikers, runners, boaters, and walkers were out in full force. Musicians, street performers, and revelers reveled in the revelry! And DOGS, yes dogs were everywhere! It’s a dog stalker’s dream! I forgot all about my macarons when I spotted these pups. Remember from my sneak peak? Would you believe that there was quintuple the cuteness!? Yes, my friends, I was holding out on you before. I give you Razzmatazz, Bella, Zinger, Penny, and Cinco. 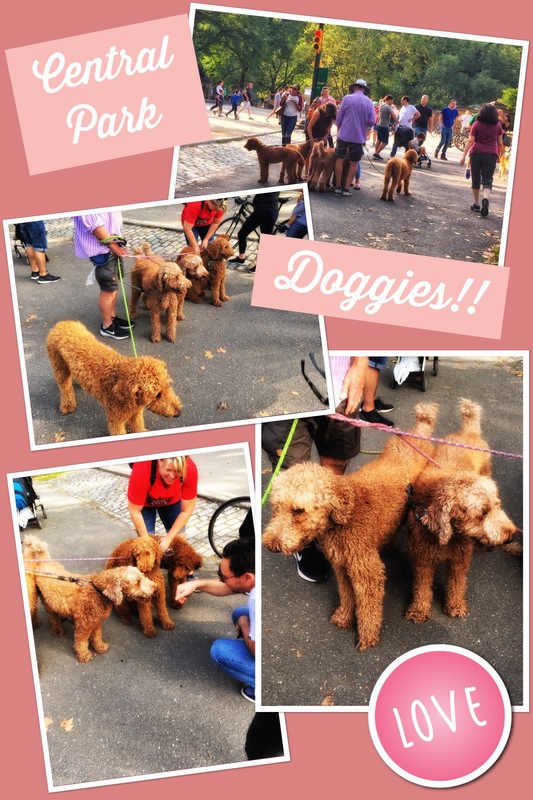 This is not a dog walker who only walks golden doodles, he is the dad to all these cuties! Lucky him! He confessed that Razzmatazz is his favorite because he’s so sweet. You guys, I have a dog stalking video of the moment I first spotted these pups. I will add it to my Instagram stories very soon. Make sure you are following me! Find me here! 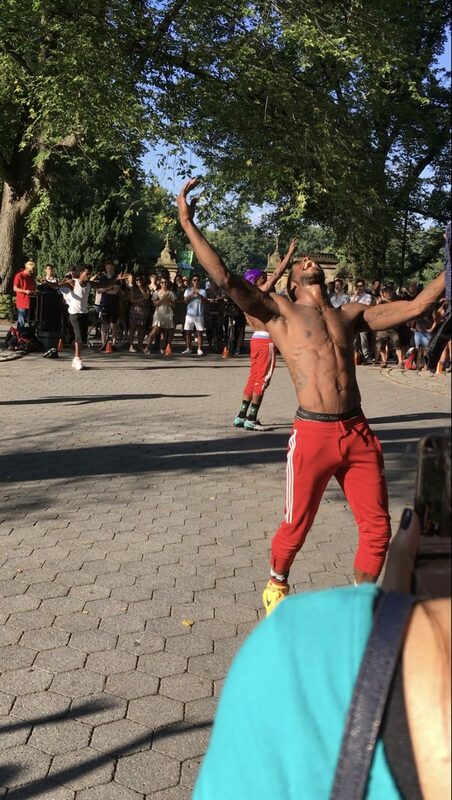 I will be sharing this along with many other Central Park highlights throughout the week. Thank you, Kathy, from Tasty Itinerary for this cool idea! If you don’t know, Kathy’s got an awesome travel/foodie blog. Check it out here. 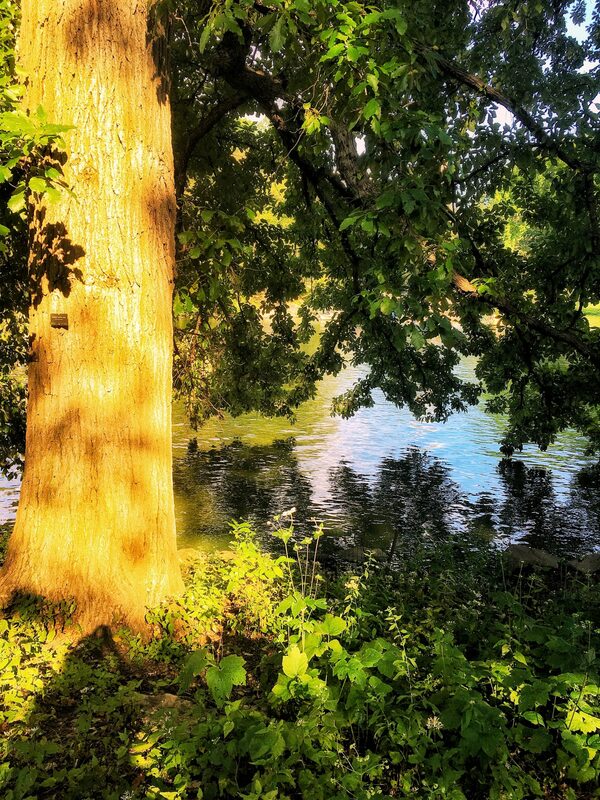 After my sweet moment with Razzmatazz and his posse, I head to my favorite spot in Central Park. This can only mean one thing…it’s selfie time. 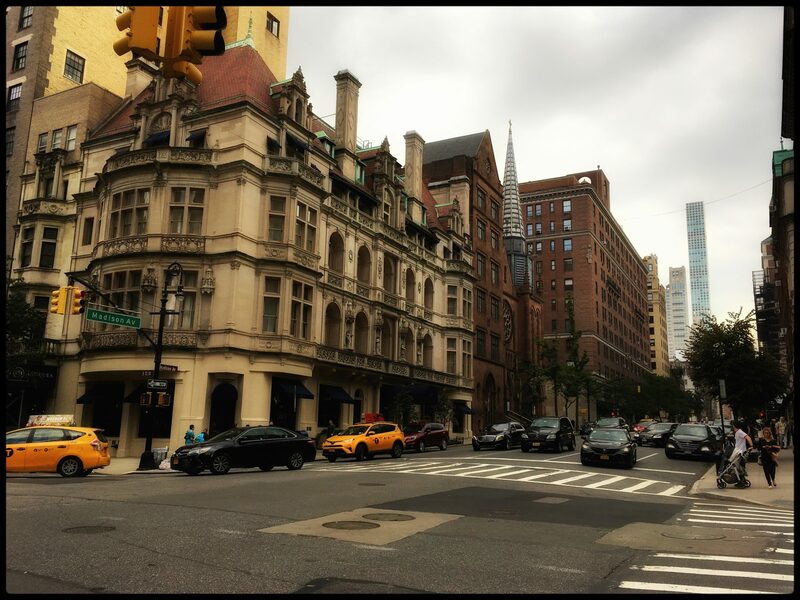 Remember this spot from my Breakfast at Tiffany’s tour? There was some kind of chess event happening. Tables were set up everywhere for people to play chess. Not really my thing so I didn’t go seek out a chess companion. Maybe I should have looked for a cute guy to play chess with? Oh well…missed opportunity! I threw a penny in the fountain and made a wish. What do you think I wished for? Stop, I’m not gonna tell you! I want it to come true. But seriously, how many fountains does a girl have to wish in though? I’ve probably wished in thousands of fountains since I was 15 years old. Do these wishes even come true? I should go get my darn penny back! 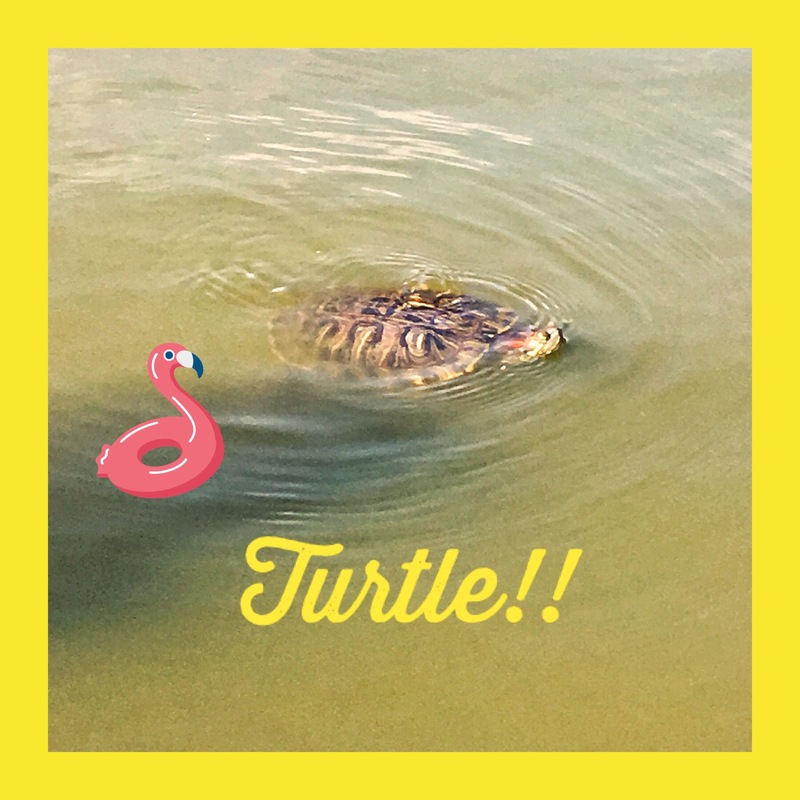 Saved from panic by a turtle, sweet! I actually have a lovely video of a turtle couple but then they went their separate ways and it made me a little sad. I hope they found each other again. They looked so happy! Now it’s time to get to my macarons. I sat down at a nearby bench to relax and enjoy the goodies. They look beautiful, don’t they? I popped a few in and enjoyed the different flavors. I especially liked the caramel one. I’d get more like that one if I go back. Ones that are too fruity aren’t my thing and there also was a minty one that was a little weird to me. I do like a good minty Girl Scout cookie though, but in cake and jelly form, not my thing. Still, overall, these were very tasty and I’d definitely go back for a few dozen more if I’m in the neighborhood again. 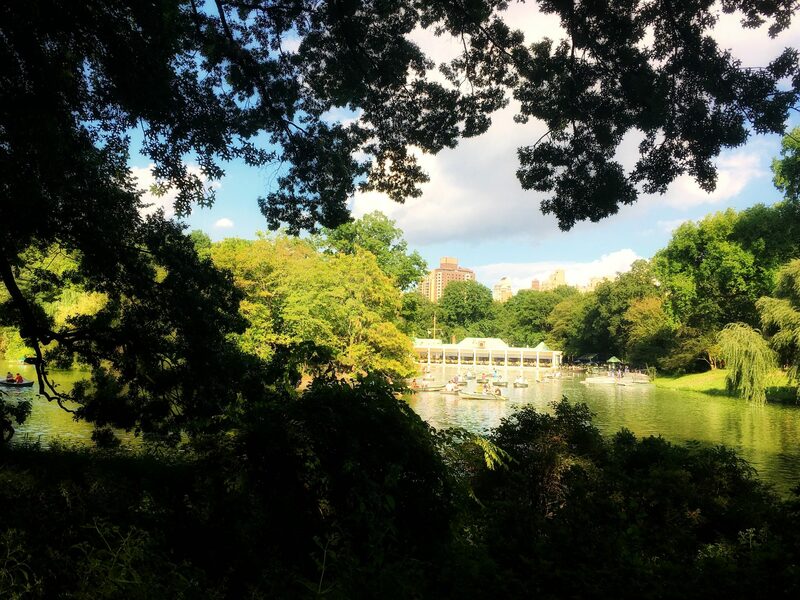 Prior to this tour, I had thoughts of venturing out to really explore Central Park. 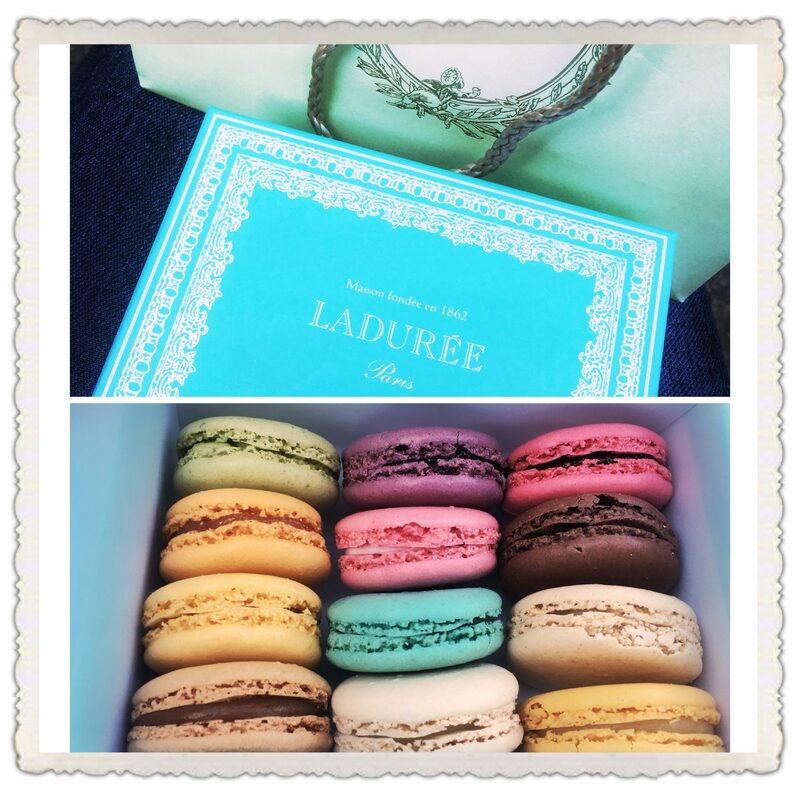 However, once I sat down with my macarons and just enjoyed the scenery that passed before me, I did not want to move. I realized a little relaxation is what I needed so that’s what I did! Look at this tree! Beautiful, right? There’s a point in the book when Molly and Daniel are in Central Park and it starts raining. They took cover under a tree and had a “moment.” I’m not gonna give any spoilers, maybe their moment was that they were stuck under a tree for a long time and then Molly broke out some macarons for them to survive on? Well, I’m not going to say. Finally, I tore myself away from that particular bench I was sitting on and decided to venture to a different part of the Park (probably to go sit again). Look who I run into! I found Brutus!!! Where’s Valentine? 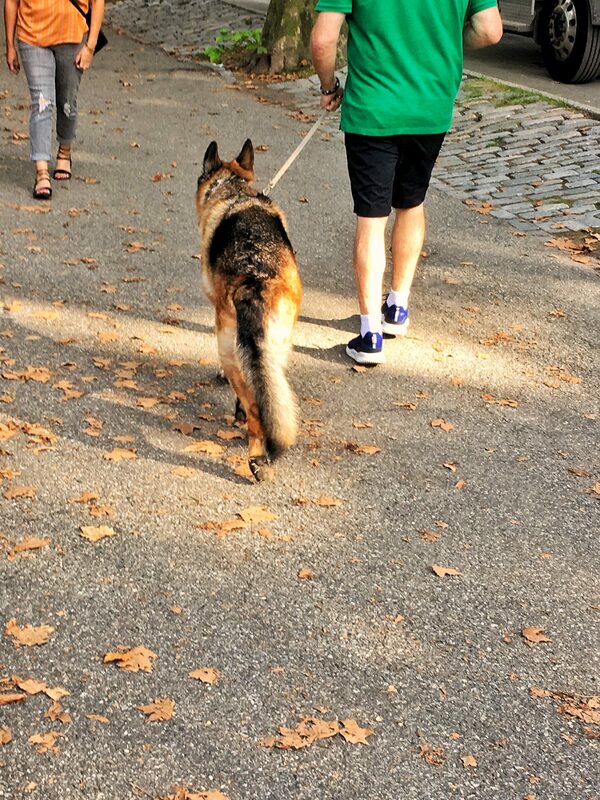 After Brutus rudely ignores me, I head over to my other favorite spot in Central Park, the walkway called the Mall, which is the path that leads to Bethesda Fountain. Walking towards this spot, I passed so many people: street performers, musicians, artists, bubble blowers, and people out enjoying it all. 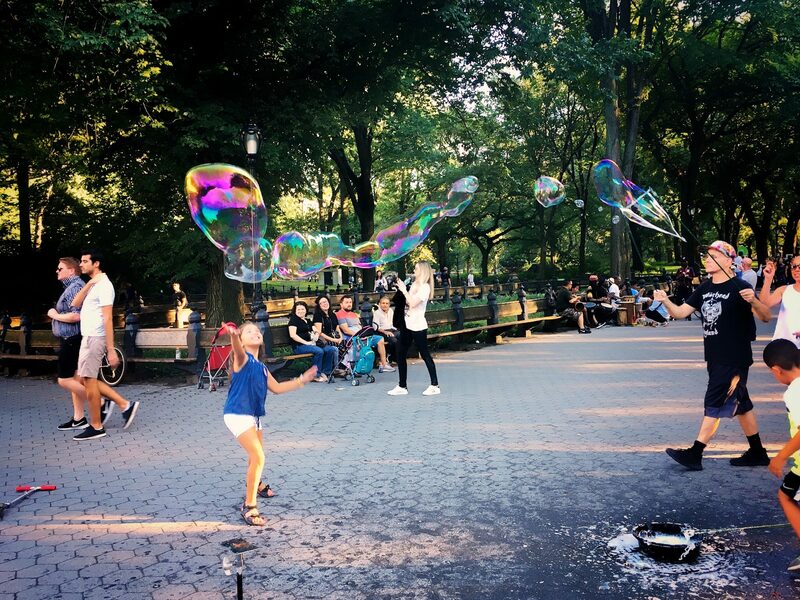 I love the happiness this little girl exudes as she tries to “catch” the bubble. I’m going to take a moment to be honest. For a little while, I was feeling a bit lonely out there by myself. Most everyone was with someone. 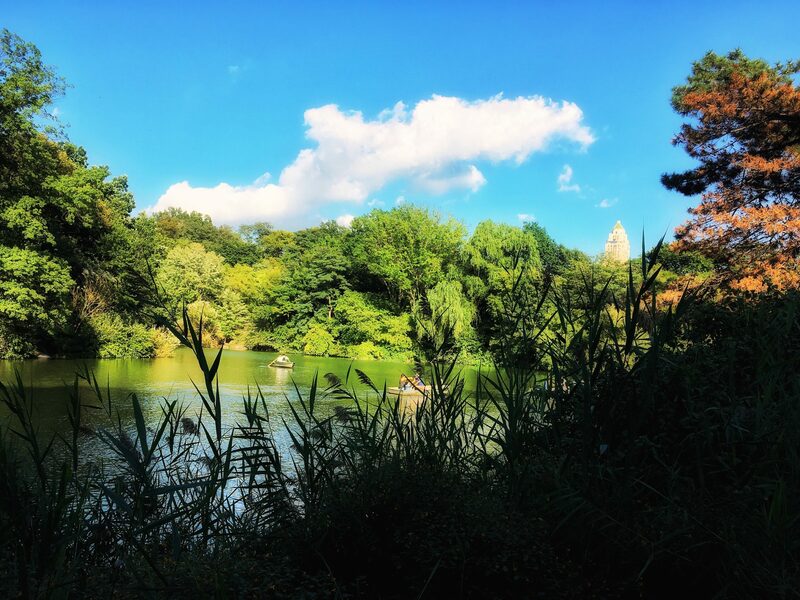 I started feeling like, “What am I doing here on a beautiful day in Central Park all by myself?” I should have someone to share it with. When you’re single, you can’t escape having these feelings from time to time. Of course, I also could have been here with some good friends. However, I was more than likely noticing the sweet looking couples that passed by me when I was having these feelings. Anyways, what can you do? These feelings will always be present, however, once I started following the music and sitting down to enjoy that and soak in the atmosphere, I started to enjoy the moment. Music is seriously therapeutic. Watching those bongo players and that cute little boy and other people dancing up there, I couldn’t not enjoy my time. The energy that was all around me quite literally was infectious. And just look at this cutie! That couple arm in arm is watching their little daughter interact with the musicians. She was shy at first, but she approached them. It was pretty cute. Okay, let’s get serious…I need ice cream. I got a childhood favorite, the eclair ice cream bar. It was a bit freezer burned, but you won’t see me complain. I bought 3 magnets while I was there. The Audrey Hepburn one because it’s a throwback to my first tour post, the famous Love sculpture because I love it & it was once featured in an old post, and The New Yorker one because doesn’t that look like Molly and her Dalmatian, Valentine? It’s the perfect memento for this tour. 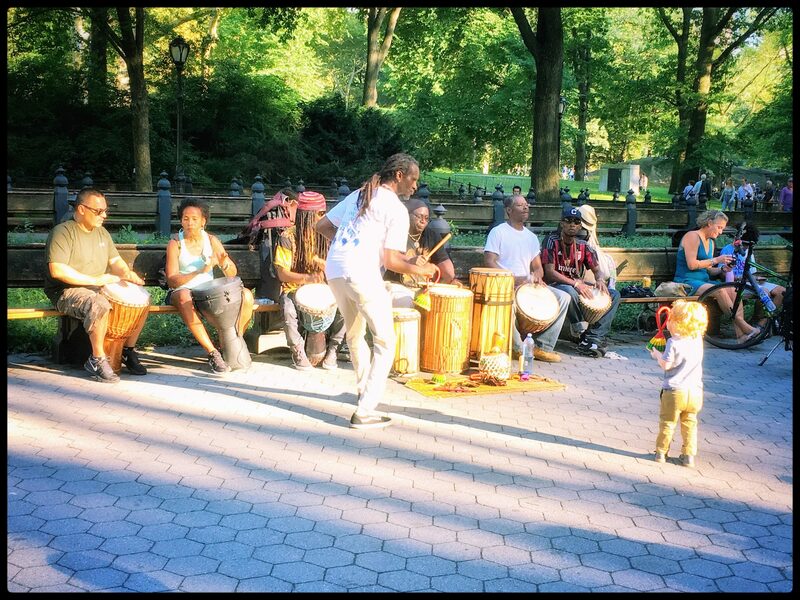 As I was leaving Central Park, I came across another musician who captured the quiet beauty Central Park can often have. I also found tango dancers! How cool! A pivotal scene between Molly and Daniel happens on top of the Met, so that’s where I head next. I head up to the roof. I almost felt like a NYC anthropologist while up on this roof. In the darkness I felt hidden and I could hear pockets of conversation. I seemed to go completely unnoticed, which was fine by me. 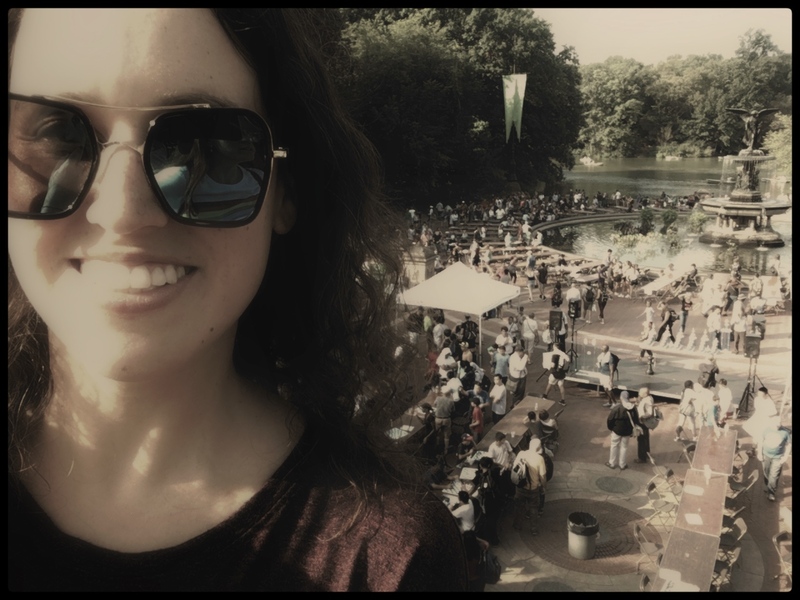 I was like the Jane Goodall of NYC up on that roof. Lots of chatter and excitement up there, sometimes some fake laughter, but for the most part, it had a good energy. Couples and groups of people were bonding amidst the spectacular atmosphere. Maybe one day I’ll bring a date up here? After I had my fill of the roof, I admired some of the exhibits. Next I head outside and since the atmosphere is still amazing and there’s a sax player setting the mood, I sit down on the steps and eat a couple more macarons. I mean what would you have done? I will share a video of the sax player on instagram. As you can see, it’s getting late and this modern day Cinderella must get home before she turns into a pumpkin. I had no prince, but I still had a magical day in NYC. I hope you enjoyed it. Please come find me for more fun on Instagram. 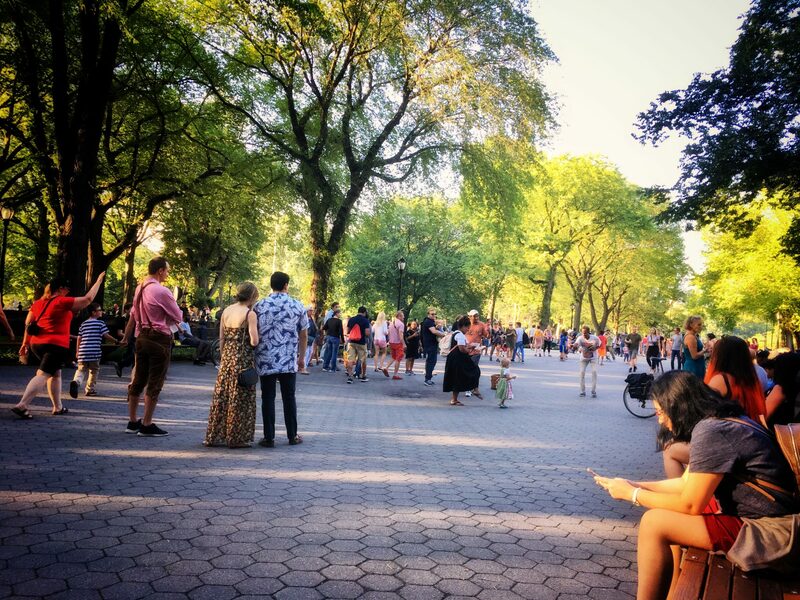 You’ll see my dog stalking shenanigans, musicians, the energy of Central Park, and tango dancers! Find me @literary_dates. Also, look for me on Twitter here. Finally, I’m on Pinterest too! Add me here. Thank you so much to author Sarah Morgan for giving me a cool book to read and inspiring such a great tour. To learn more about Sarah Morgan and her books, check out her site here. Thank you again Sarah Morgan! I absolutely loved this post for SO MANY REASONS. I want to reread it after you retweak the pictures, but what a great post! First of all, I LOVE that you went and walked a dog at the shelter. I’ve heard any shelters do this but I have never sought one out. What a great idea! Also, poor doggie. He obviously remembered living in an apt building. I hope he gets adopted out soon. Thank you for giving this little guy some love. 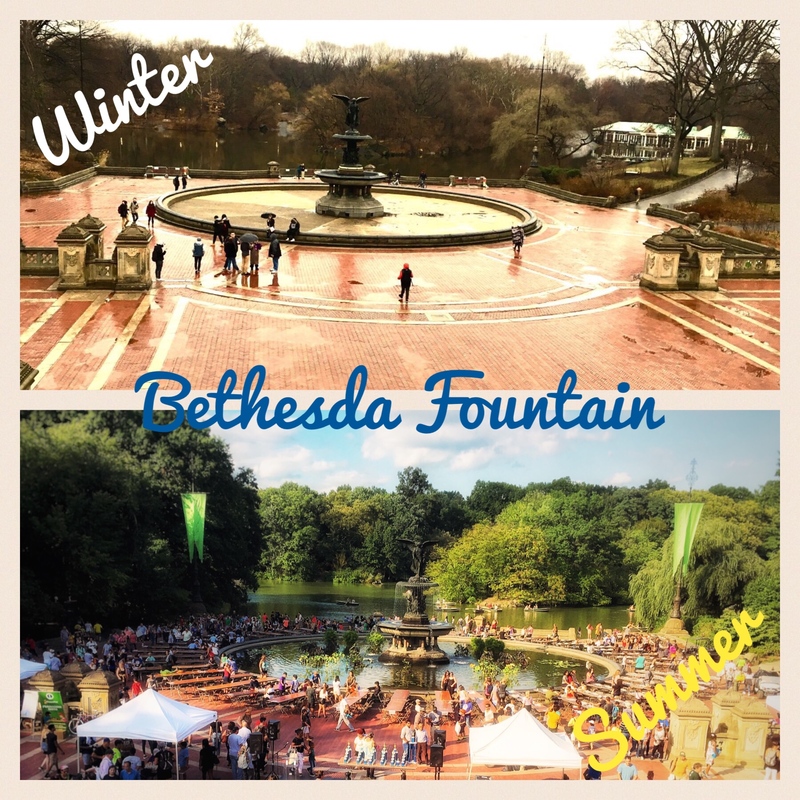 I loved your pictures (the ones working) and the before and afters of Central Park. So lively and lush, so different from the last time you were there for Breakfast at Tiffany’s. I miss Central Park. I have a ton fo good memories there from when I was a kid. Between my pictures not working and my original comment back to you not going through. Geez! This site. Hopefully the pictures are fixed forever. Either way, I’m going to be studying the support forums. Thanks so much for reading and commenting again! I’m so glad you liked it. That sweet dog…he broke my heart. Hopefully he finds a loving home soon. 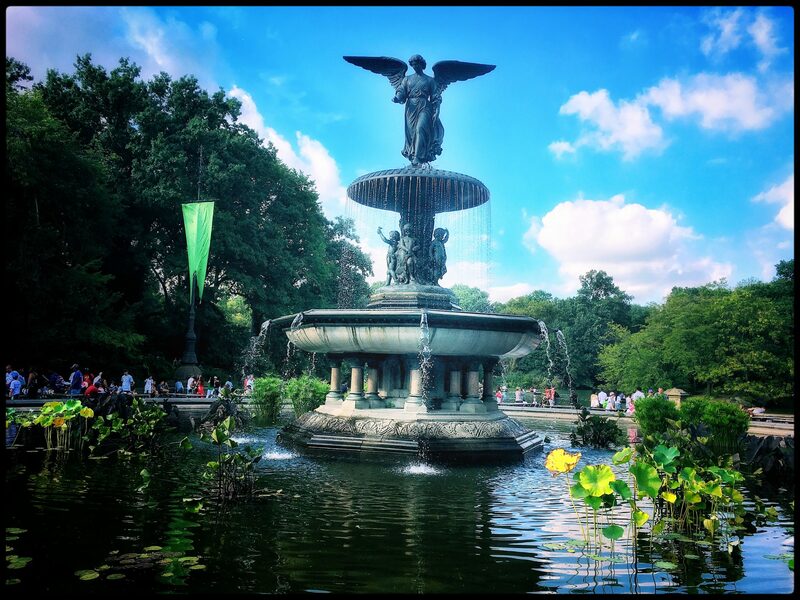 It was so nice being at Central Park! So full of life there. Do you have any favorite spots there from your childhood? That panini was ridiculous! It apparently was a Milanese panini but whatever it was, it was all arugula and completely not tasty. Tasty Itinerary would not approve! Thank you again! Can’t wait for your post (but I can be patient). You’ve got some killer people watching skills too, and holy cow so many dogs! Love!! You ended the night perfectly–if I ever make it to NYC, we could have an awesome friend date for sure 🙂 Amazing job on this tour, can’t wait for the next one!! Awww thank you! That dog was very sweet. I hope he finds a good home soon! That sandwich was the absolute worst. It kills me how so many places skimp on the cheese when that’s the only filling part of the sandwich for a vegetarian. Argh. I could rant a lot about this but I won’t. Haha. Meet-cute! I like that! Is that a writing term for romantic stories? This looks like so much fun! 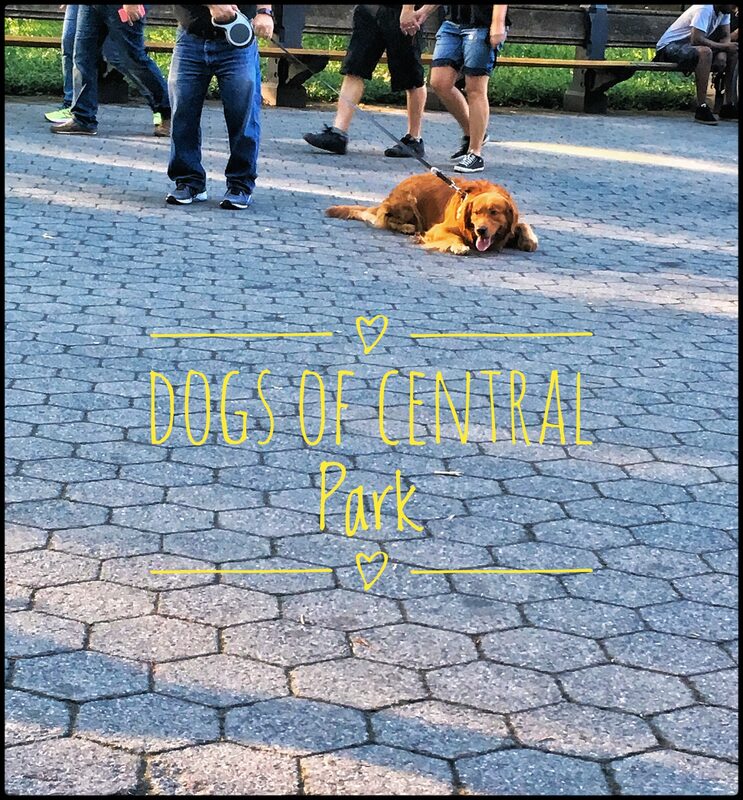 I love all of your photos and the dogs of Central Park. We have dogs of our own and I still get giddy when we run into others on the street! Thanks so much for reading! I love dogs so much. They are amazing! What a great idea finding an activity that was compatible with the book. A trend for future tours? Heyyyy!!! Thanks so much for reading again! Yes! Definitely. I’ve done it a couple other times too in the past. The ones that stand out in my mind are my Annie Van tour and my Modern Lovers tour. The post was insanely good and beautiful and insightful and exciting! All in one! I love, love, love it!!! Dee!!! Thank you thank you for reading my latest one! Such kind words. You’re the best! Glad you liked it! This is SO fun!! Thanks for sharing photos!! <3 Makes me want to go to NYC ASAP! Love this post!! On so ready to take a trip! Love your blog!! Hi Holly! Thanks so much for reading my blog post! I’m so glad you liked it! You definitely should take a trip here. It is a pretty cool city! This is my first time on your blog and I am loving this post. 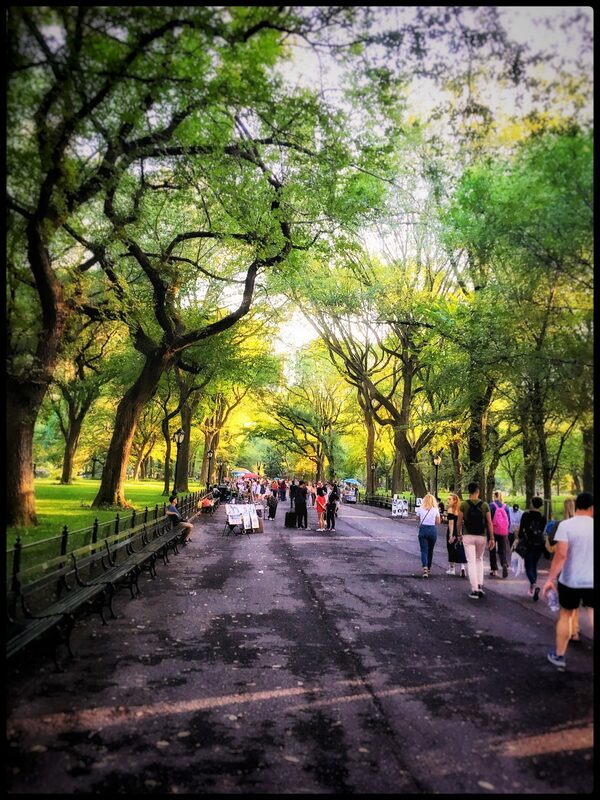 Central Park kind of came alive in your narrative and the pictures and those macrons looked yummy :). I have gone through some pages in your blog, particularly the About section and would love to read more. Even though I live in another part of the planet and have never been to your part of the world, but still felt a nearness to the place you described here :)…. I tries to find you on twitter, couldn’t get your twitter handle….hoping you will share it. Thank you so much for checking out my blog! I’m so glad you liked it! Thanks for leaving such a thoughtful comment. I’m sorry you weren’t able to find my Twitter. That’s a bummer! I guess the link didn’t work? My Twitter handle is @LiteraryDates.